Click here to buy survival kits! one t-shirt, and it stunk to high heaven. As is my custom, after a shower, I piled all the clothes in a filthy heap in the laundry room and prepared to wash them. But we had no laundry soap. I headed down to the local Safeway, and went directly to the laundry aisle. But there were no good deals, and I got sticker shock. For some reason, all laundry soap has gone sky-high, and the usual large Tide we buy for our frontloader washing machine was more than $15! My penny-pinching, Depression-era, Do-It Yourself mentality kicked into gear. So I got on the internet and found this recipe on the Busy At Home blog. The ingredients to make this liquid soap are simple and cheap, and the savings are substantial. You can buy everything you need at Walmart or Safeway. The ingredients are simple and cheap, (I already had everything but the Fels Naptha soap) and the DIY soap worked very well on my backpacking clothes, as well as several other less-challenging loads of normal clothing over the past couple weeks. This is what the DIY laundry soap concentrate looks like after setting overnight. It will be diluted 1:1 with water before using. Cut Fels Naptha bar into fourths and store the extra three in a ziptop bag. Grate the Fels Naptha and put the shredded soap in one cup of water in a sauce pan and melt over medium-low heat, stirring constantly. Cook until the soap has dissolved. 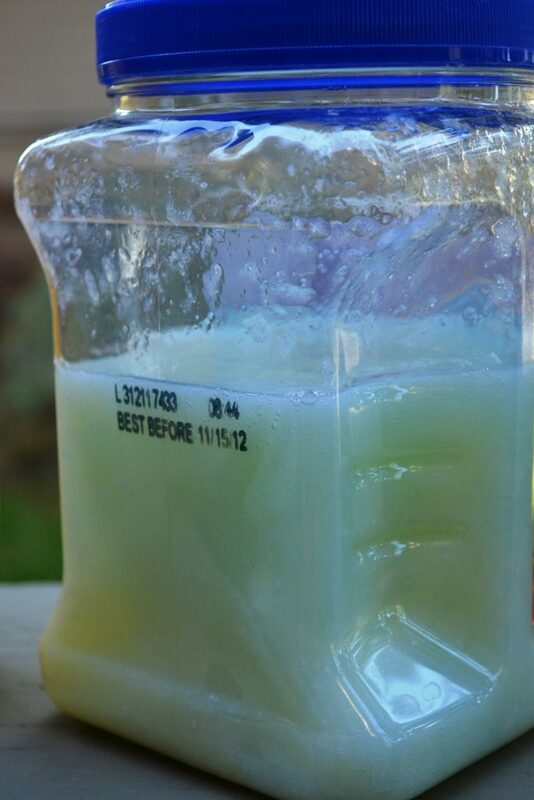 Pour 10 cups of water into a large container or bucket and add the cooked soap mixture, Borax and washing soda. Stir, and add 10 more cups of water, then stir again. Cover the mixture and let set overnight. The soap mixture will gel. Stir it up and transfer into two containers. Dilute the gel mixture one to one with water. If you’re storing the mixture into empty milk jugs or some other size container, fill the container half full with soap and then finish filling with water. Then you’re ready to use the soap. Use 1/4 cup per load. This recipe is so simple, and the soap is so effective, there is no excuse for not using it. Making the recipe didn’t require any skill. It didn’t take me 15 minutes to make my first batch. A critical aspect of urban survival is a wise use of your resources. 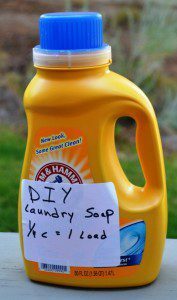 Take the savings from making your own laundry soap and invest that in other preparedness or survival items you can’t compromise on, such as your survival knife, sleeping bag or boots. To view the complete soapmaking story, click on the Busy At Home blog. 7 Comments on "DIY Recipe: How to make frontloader washing machine laundry soap"
Thanks for sharing. Laundry detergent has gotten so expensive! just pour the spoon into the washer as the water is coming in & have had no problem. the bar soap you will find on the top shelf where the stain removers are (at least in the Publix I go to) it runs $1.19 use to be $.99. If you are going to do it you could do enough possibly to put into 1 of the buckets where it would be easy to store. I love that this is a scaled down version of the recipe. I don’t want to store 10 gallons of detergent. I am going to make the concentrate and see if it’s as easy as this one. Thanks! This is our recipe…we have used it in our top loader and wringer(when it works!) any extra dirty loads get an extra shot of borax. just make sure you use laundry soda! and straight borax, not a borax-added mix. @ Chip Johnson – I just ordered the ingredients from Amazon and I wondered, for a top loader machine, do you use 1/4 cup just like the front loaders do? I’ve read other blogs where people use 1/2 cup for top loaders but I don’t want to use more than I need to. Thanks in advance to you, and also thank you Leon for inspiring me today!